AFS Analytics is a web analytics service that offers the most advanced data analysis for your Drupal website. With this advanced tracking tool, you will get advanced statistics and information about your website visitor behavior. Easy to install, AddFreeStats Analytics is the perfect tool for your Drupal website. 1)	First you need to register an account on AFS Analytics. The signing up is simple and takes only a minute. 2)	After signing up, you will get access to a unique tracking code that you can place anywhere on your site. 3)	Log in to your Drupal website. 4)	After logging in, click on "Structure" under the "Admin" menu. 5)	After that, go to the “Blocks" on the new window that appears. 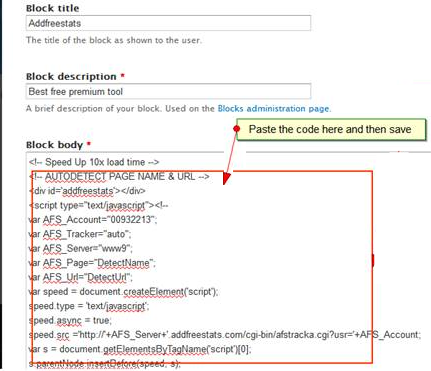 6)	Now Select on "Add Block". 8)	On clicking "Save block", the AFS Analytics block is ready and the next step is now to add it to the footer of the website. 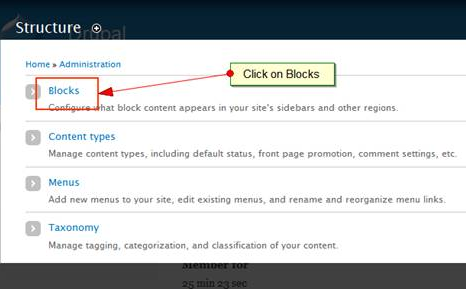 9)	To add the AFS Analytics block that was created to the footer, scroll down to the bottom of the page and locate the block with the name that you assigned as the description in Step 5 above. 10)	Drag and drop the Block into the footer section where it will always appear. 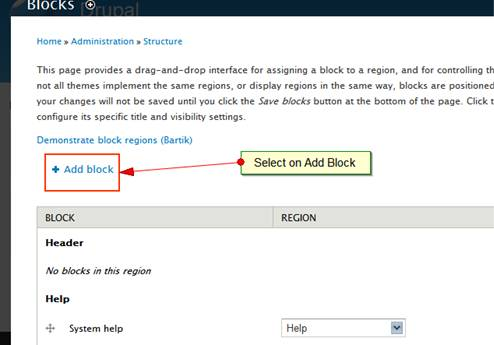 11)	Finish the whole procedure by clicking on "Save Blocks". This marks the end of the installation of the tracker tool to your Drupal website. After these steps the Addfreestats system takes over and starts to record and analyze visitor details. To check out the analytics and change the options, one can see the details by clicking on the button or by logging into your AFS Analytics account where you can also change options and settings. From your account you will be able to see advanced tracking analysis based on time, visitor durations and other advanced analysis which helps you to improve your site performance.